By Rusty Rae LE MANS, France -- Unbelievable! Not even the Bard himself could have written an ending so exciting and so gut-wrenching as what fans witnessed at Circuit de la Sarthe Sunday afternoon. The under dog No. 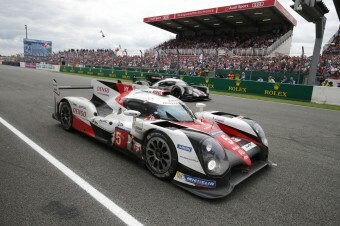 5 Toyota TSo5o Hybrid that had taken the fight to the vaunted Porsche Team all race long and was within a lap of earning its first overall victory at the storied event stopped with less than four minutes left in the race at the start-finish line. Driver Kabuki Nakajima could only watch helplessly as the No. 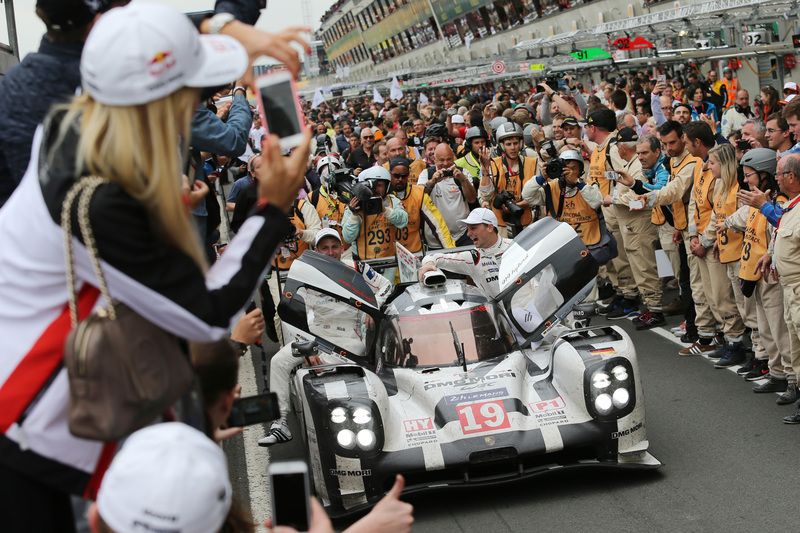 2 Porsche driven by Neel Jani zoomed by him and went on to win the 2016 version of the 24 Hours of Le Mans, the brand's 18th overall win. The events of the day left the Toyota team shell-shocked and the Porsche team euphoric with television coverage of the event showing members of the German brand rolling on the pit floor in their joy. Team Toyota could only remain stoic about the events of the day and look forward to better times. The No. 5 Toyota had a 1:14 lead on the No. 2 Porsche with seven minutes left in the race. The Toyota Team, that had come into the race as an underdog, sporting a new chassis and a new engine package got stronger throughout the week of preparation and on race day was the matching of the winningest brand in Le Mans history for 23 hours and 56 minutes. Cruel as the fate of racing can be at times, the old adage "To finish first, first you must finish" comes to mind. Even so, the Porsche team was in disbelief even on the podium as the win had not really sunk in and Olivier Jarvis, the Audi driver of the third place No. 8 car perhaps summed up best the feelings on the podium in this report. 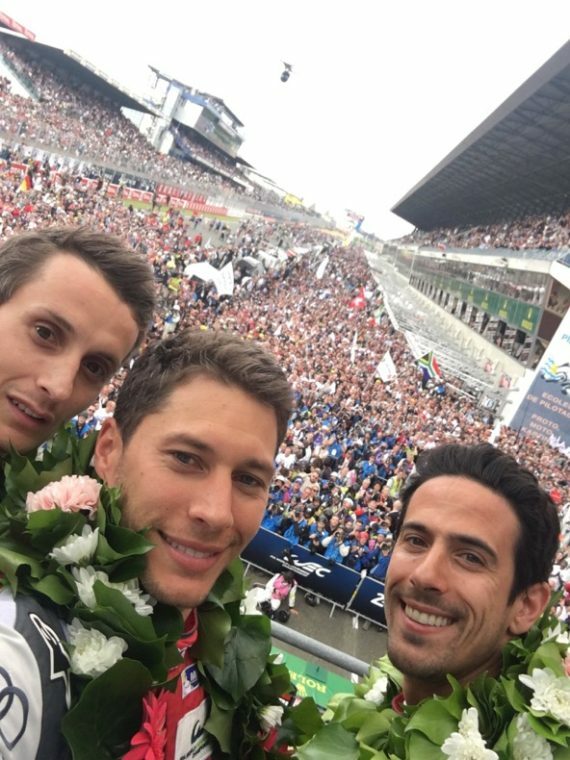 The third place Audi team from the podium with an estimaged 35,000 fans in the background. But the team did not really want to be on the podium -- knowing that the Toyota had really earned the spot and that they were only there thanks to a funky French rule. (photo from Loic Duvall's twitter feed). And what of the Audi Team that was gifted a third place podium finish thanks to the downfall of the Toyota but seemingly could not get out of its own way during Le Mans week. The season started on a sour note when its car was excluded from a winning performance at Silverstone due to a minor technical non speed advantage issue found in inspection after the race. Winning at Spa gave the team some confidence coming into Le Mans, and the team turned the fastest time in the pre-race practice session two weeks prior to the event. But race week Audi did not seem its self. The weather was wet and somewhat unpredictable, usually an advantage for the team from Ingolstadt. But it seemed, at least from afar, that Audi could not find a rhythm and never approached its performance from the test day, finishing in the fifth and sixth place positions on the grid with Porsche holding the top two spots and the Toyota in the three and four slots. Historically, qualifying has not meant much to the Audi team as they have regularly come from lesser grid positions to earn victories at Le Mans. But this year the Audis spent too much time in the pits uncharacteristically fixing parts that in the past have been bullet proof and which gave the team a decided advantage. Additionally, the ACO, the governing body of Le Mans, has put a number of restrictions on the diesel engine, so that the R-18 Quattro Hybrid is at a disadvantage when it comes to fuel efficiency. While the Toyota was pulling 14 laps per tank of gas the Audi could only run 12 before it needed to pit for fuel. But Audi is not even the second or third story of this Le Mans. It belongs first to the Toyota Team that battled fiercely against its European completion, asking no quarter and giving none, as it showed both speed and agility on the 8.65 mile Le Mans course. Both the Toyotas led the race at one time or another and on Sunday morning the two Toyota challenged the leading Porsches (at the time) to a high speed pavement duel staring down the defending champions with a combination of speed,, handling, a deft driving. Until that last four minutes. Perhaps overshadowing all three of the LMP1 Hybrid teams at Le Mans was the performance of the Box 56 spot, which is reserved for special projects by the ACO. This year the spot went to the No. 84 LM P2 Nissan entered by SRT41 by OAK Racing and driven by Frédéric Sausset, the quadruple-amputee. Sausset, along with co-drivers, Jean Bernard Bouvet and Christophe Tinseau who drove the car conventionally. 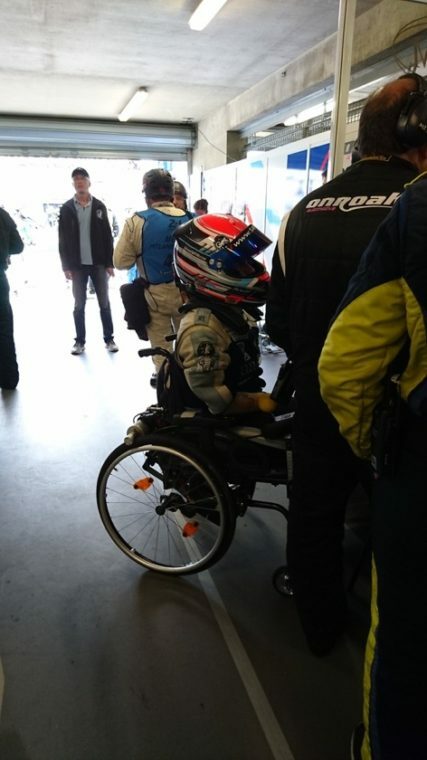 Frédéric Sausset, a quadraplegic amputee, awaits his next stint on Circuit de la Sarthe. He and his teammates finished 39th overall. Simply amazing! Sausset's story is really amazing and is a chapter of Le Mans that should inspire everyone. In 2012, Sausset scratched his finger while on vacation in the southwest of France. Tragically, the scratch rapidly led to a life-threatening infection (necrotizing fasciitis) which left Sausset a quadruple amputee. At the point where many of us might just give up and wallow in depression, Sausset instead decided he wasn't going to let the lack of hands or feet get in the way of a life-long ambition—racing in the 24 Hours of Le Mans. The car, a technological masterpiece, was modified to allow Sausset to drive using all of his limbs to control it and a special prosthesis to steer. The car was also fitted with the standard components that would allow his co drivers to driver the car normally, if that is the proper use of the word. It is one thing to drive the car at speed with no hands and no feet -- it is quite another things to finish the grueling the 24 hour race -- and Sausset, Bouvet, and Tinseau did finish. Although by rule not officially scored in the results the No. 84 Nissan would have finished 38th overall. In the other story of the 2016 24 Hours of Le Mans the return of Ford to the race 50 years after its first win in 1966 saw the Ford Chip Ganassi Teams USA take the GTE Pro win and third place with a race-long duel with the Ferrari 488.The LM P2 winner was the No. 36 Alpine A460 Nissan-powered car while the GTE Am winner was No. 86 Porsche 911 RSR. Ultimately, Le Mans, the pinnacle event of endurance racing (and perhaps of all motorsports), will define all three teams (Porsche, Toyota, and Audi) not by the finish of the 2016 race, but by how each of the teams responds in the coming events of the World Endurance Championship (WEC) in the final six races of the series that will end in Bahrain in late November. Porsche is perfect at Le Mans: takes 17th overall win! LE MANS, France -- At the midway point of the 83rd running of the 24 Hours of Le Mans the two German marques are battling "tooth and nail" for the penultimate endurance race title with four of the six factory cars swapping leads during the first half of the race on Circuit du la Sarthe. As the clicked over into the second half of the race, it was the No. 19 Porsche 919 hybrid with Nick Tandy at the wheel leading the field. Close behind were the No. 9 and No. 7 Audi Quattro Hybrids. The two Audis, with Marco Bonanomi and Andre Lotterer, respectively, at the wheel respectively, are a tad over a minute behind the leading Porsche. In fourth place is the No. 17 Porsche that is on the edge of being a lap down to the field. The No. 8 Audi is two laps down to the leader while the No. 18 Porsche is three laps down. 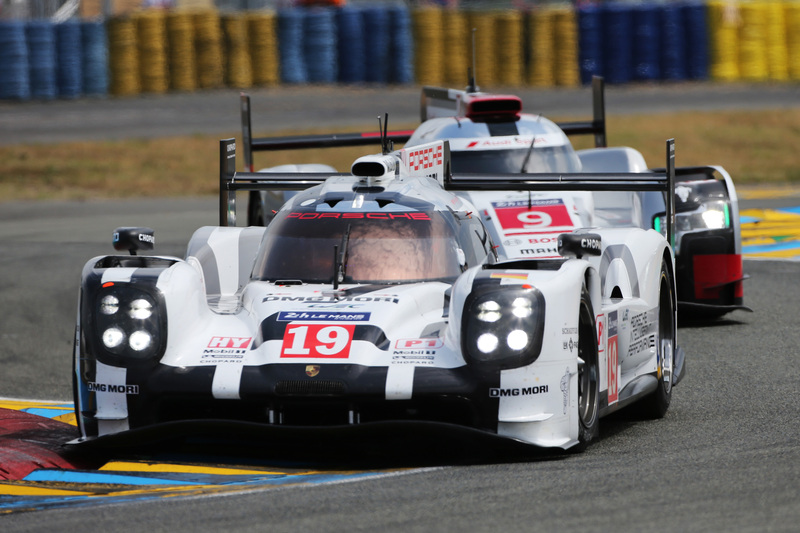 The Porsche 919 Hybrid set the pace in qualifying as it captured the top three positions, led by Neel Jani in the No. 18 car with a 3min 16.887sec lap which topped the previous top qualifying time of Stephane Sarrazin in a Pugeot 908 which was set in 2012. While Porsche was busy smashing records, Audi was spending its time testing in readying for the race. It had the the most laps during the two days of testing and qualifying and though its times were three seconds off the torrid pace set by Porsche the defending Le Mans champs nevertheless filled the four through six slots on the grid. Toyota, the defending WEC-FIA World Endurance Champion, was off the pace set by the two German brands and took positions seven and eight. Newcomer Nissan, although it showed exceptional top end speed on the long Mulsanne straights, was far enough off the pace that stewards required them to start from the back of the grid. When the green flag dropped the Porsches and Audis simply split from the field and went after each other, trading the race lead as often as they pitted. During the first eight hours of the race Loic Duvall in the No. 9 Audi Quattro Hybrid laid down the fastest lap of the race and the fastest lap in the history of the modern configuration of the historic track. Duvall turned a lap just over 3 minutes and 17 second, 154 mph and change average for the 8-plus mile track. That lap effective topped the previous record of Loic Duvall in the Peugeot 908 by nearly two seconds and the previous all-time fastest lap set in 1971 before the chicanes were added to the Mulsanne straightaway. The pace of the race has been fast and if there is no major yellow, it would appear as if the distance record for the race will also be broken. At this writing the Toyotas are merely filling space and are not able to keep up with the front runners and there is more than a rumor that next year they will return the endurance racing wars with the turbo-charged gasoline engine. However, they are currently going as hard as they can -- but are mired in the back of the pack. So too is the case of the newcomer Nissan team that is gaining valuable experience with its front-engined front drive car, but which is not able to keep up even with the LMP2 cars. In the end it appears as if the winner of the race will be the team that is the most efficient and judicious in their application of pit stop strategy. Currently the Porsche appears to have a small advantage in the number of laps that it can run per tank of gas. However, Audi has performed at near genius level when it comes to managing its pit stop strategy. In the end, all things remaining the same, it should be an interesting final 12 hours.